An early 20th century Igbo 'medicine man' in Nigeria, West Africa. Traditional African religions are the traditions of the religious groups in Africa. After Christianity and Islam, they are the third-biggest religious group in Africa. These religions still stick to their traditions. They are folk religions, and combine different beliefs. In general, people in the cities confess to either Christianity or Islam. The people outside the cities confess to the traditional religions. These religions are omnipresent in everyday life. All that happens has a supernatural cause, rooted in religion. People are born with a certain religion. Normally conversions from one belief system to another do not take place. There is a central belief in a life force which links everyday life with the metaphysical. Generally, such religions are full of life, and have a low esteem for an ascetic lifestyle. There is also the fear of spirits, the dead, and of magic, which influence everyday life. Practitioners of traditional religions in Sub-Saharan Africa are distributed among 43 countries, and were estimated to number over 100 million, although the largest religions in Africa are Christianity and Islam. 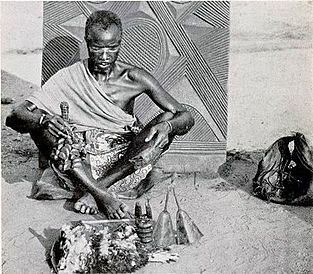 West and Central African religious practices generally manifest themselves in communal ceremonies or divinatory rites in which members of the community, overcome by force (or ashe, nyama, etc. ), are excited to the point of going into meditative trance in response to rhythmic or mantric drumming or singing. 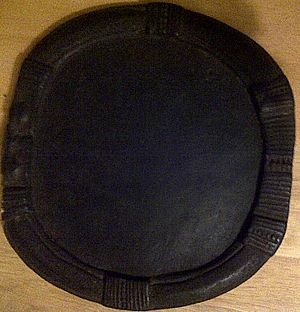 One religious ceremony practiced in Gabon and Cameroon is the Okuyi, practiced by several Bantu ethnic groups. In this state, depending upon the region, drumming or instrumental rhythms played by respected musicians (each of which is unique to a given deity or ancestor), participants embody a deity or ancestor, energy or state of mind by performing distinct ritual movements or dances which further enhance their elevated consciousness. When this trance-like state is witnessed and understood, practitioners are privy to a way of contemplating the pure or symbolic embodiment of a particular mindset or frame of reference. This builds skills at separating the feelings elicited by this mindset from their situational manifestations in daily life. Such separation and subsequent contemplation of the nature and sources of pure energy or feelings serves to help participants manage and accept them when they arise in mundane contexts. This facilitates better control and transformation of these energies into positive, culturally appropriate behavior, thought, and speech. Further, this practice can also give rise to those in these trances uttering words which, when interpreted by a culturally educated initiate or diviner, can provide insight into appropriate directions which the community (or individual) might take in accomplishing its goal. Followers of traditional African religions pray to various spirits as well as to their ancestors. These secondary spirits serve as intermediaries between humans and the primary God. Most African societies believe in a single Supreme Creator God (Chukwu, Nyame, Olodumare, Ngai, Roog, etc.). Some recognize a dual God and Goddess such as Mawu-Lisa. For example, in the Serer religion, one of the most sacred stars in the cosmos is called Yoonir the (Star of Sirius). With a long farming tradition, the Serer high priests and priestesses (Saltigue) deliver yearly sermons at the Xoy Ceremony (divination ceremony) in Fatick before Yoonir's phase in order to predict winter months and enable farmers to start planting. In traditional African societies, many people seek out diviners on a regular basis. There are generally no prohibitions against the practice. Those who divine for a living are also sought for their wisdom as counselors in life and for their knowledge of herbal medicine. In some traditional African religions, morality is associated with obedience or disobedience to God regarding the way a person or a community lives. Some sacred or holy locations for traditional religions include Nri-Igbo, the Point of Sangomar, Ife, Oyo, Dahomey, Benin City, Ouidah, Nsukka, Kanem-Bornu, and Igbo-Ukwu among others. African traditional religion Facts for Kids. Kiddle Encyclopedia.